A test of the service has been underway for several months in the retailer’s Harlem and Chelsea locations in Manhattan. Company officials say they are pleased with early results and are hopeful to expand the convenience to all its stores soon. The test comes in partnership with FutureProof Retail, a locally based startup providing the technology behind the offering, which works as part of Fairway’s mobile application. FutureProof is providing a similar service to the Colruyt Group and its Spar stores in Belgium. The technology works as a part of Fairway's mobile application. In an interview, FutureProof co-founder and President Di Di Chan said the checkout-free offering meets the growing demand for shopping convenience stoked by virtual alternatives, while providing Fairway with a point of difference in a market where online options are plentiful. FutureProof Retail President DiDi Chan at a Fairway Market store testing the company's mobile shopping technology. Chan said she and fellow tech entrepreneur, William Hogben—now FutureProof’s CEO—met in a philosophy club, where they bonded over a mutual interest in the concept of saving time and shared what she calls a “geeky mission” to “maximize human potential by valuing and prioritizing the value of time.” The mission extends to having designed a sign-up process for the app Chan calls the fastest in the industry, requiring a name, email, mobile number, associated credit card and photo. While anyone who’s shopped at a high-volume Fairway store on a busy Saturday could probably relate to the “four years” remark, there’s more to it than that for Fairway. The technology can be utilized to serve special offers, recommendations and targeted marketing messages, helping to drive greater customer acquisition and loyalty, as well as generate richer customer data while differentiating the brand. FutureProof offers a “white label” technology that Chan said is customizable to the point-of-sale, payment systems and physical configuration of the associated retailer. 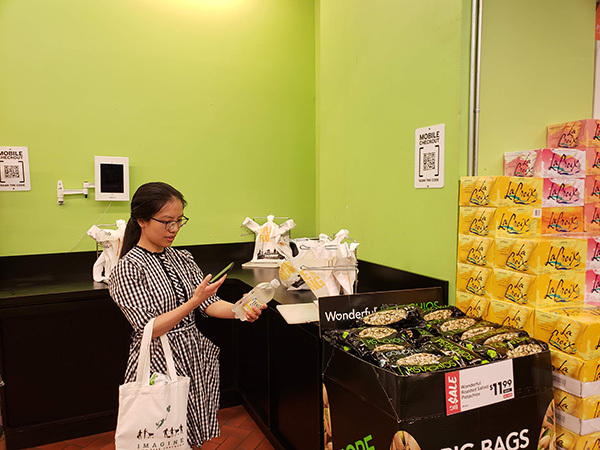 At Fairway’s Chelsea store, a counter alongside the traditional checkout, which also includes racks of self-service shopping bags, has been set aside for mobile shoppers who merely have to scan a QR code to exit. Chan says testing and results in previous rollouts indicate the technology can help reduce loss by theft—a major concern about cashierless checkout—in part by imparting a “VIP” experience for the user, letting them know they are known to the store while they are shopping. The app can also “learn” when, for example, a shopper scans conventional strawberries but bags the pricier organic variety.